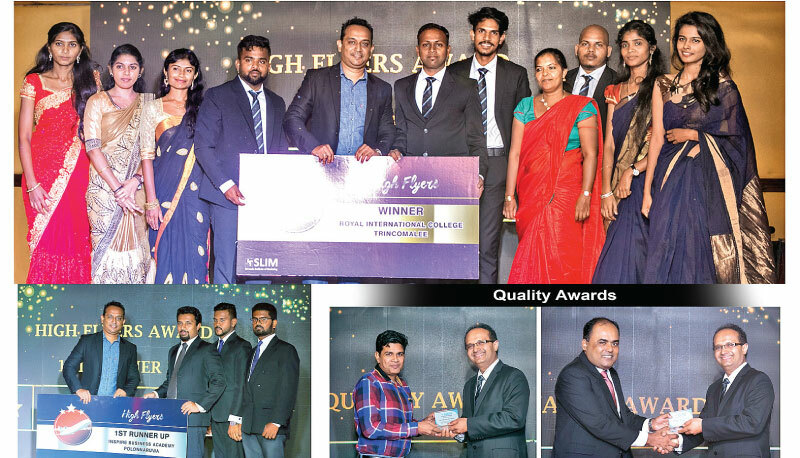 The Sri Lanka Institute of Marketing, (SLIM) organized an award ceremony to celebrate the excellence of its various Centres recently, at Waters Edge. The event was hosted by the National Institute of Marketing where several SLIM Study Centres received accolades and were rewarded for their excellent results in imparting knowledge and promoting marketing discipline among the nation’s youth. SLIM boasts a portfolio of some 22 centres scattered throughout the island, in which lectures are conducted in Sinhala and Tamil mediums as well. The Preliminary Certificate in Marketing (PCM) opens the doors for students to follow subsequent advanced programs at the institute, as it is accredited as a foundation course. The SLIM Study Centre Awards were conferred under three categories. Highest Student Enrollment, Quality of Service and Highflyers. Under the Highest Student Enrollment Category Royal International College, Trincomalee produced winners in the PCM III and IV intakes during the past year. On time submission of documentation, zero complaints from students, maintaining a good relationship with SLIM, and a great overall track record of work are a few criteria falling under the microscope in the Quality of Service Award. The winners in this category were the Sabaragamuwa Business School, Ratnapura and E BEST Campus (Pvt) Ltd, Kalmunai. In the Highflyers category the first runner-up was Inspire Business Academy, Polonnaruwa, while Royal International College, Trincomalee emerged the winner. These centers were recognized under this category for bringing in the highest revenue from Marketing in Sinhala (MIS), Marketing in Tamil (MIT) and the Preliminary Certificate in Marketing (PCM). “The SLIM Study Centers add great value to the institute as well as the entire marketing fraternity as its reach spreads throughout the country. It is through these affiliated arms that SLIM is able to execute the task of promoting and facilitating the study of marketing throughout the country. If not for theexistence of such centers, students keen on following marketing courses would be compelled to travel to the major cities of Colombo, Kandy or Matara where SLIM Business Schools are located. We are therefore glad and honored to work with the twenty-two centres under our aegis, which saves our students the need to travel very far,” stated the President of SLIM, Pradeep Edward.